The biceps muscle located in the front of the upper arm allows you to bend the elbow and rotate the arm. Biceps tendons attach the biceps muscle to the bones in the shoulder and in the elbow. Biceps tendon tears at the elbow: Although two tendons attach the biceps muscle to the bone at the shoulder, only one tendon attaches it to the elbow. This is known as the distal biceps tendon. 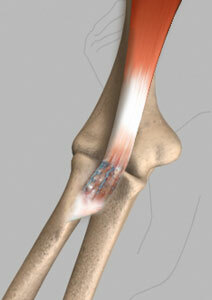 Tears of the distal biceps tendon are usually complete, and the muscle is separated from the bone. Tears of the distal biceps tendon most often result from a sudden injury or lifting a heavy object. Biceps tendon tear can be caused by injury such as falling down with your arm outstretched or during the act of lifting heavy objects. In case of overuse, a tendon may fray and eventually tear. Additional risk factors such as advancing age, heavy overhead activities, repetitive overhead sports, smoking, and use of corticosteroids can also result in a tendon tear. The most common symptom is a sudden, severe pain in the upper arm or at the elbow, depending on where the tendon is injured. At times you may hear a “pop”. Other symptoms include swelling, visible bruising, weakness in the shoulder or elbow, and trouble turning your arm from palm up to palm down. A bulge referred to as a “Popeye Muscle,” may also appear in your arm, because the tendon is no longer holding the muscle in place properly. Biceps tendon tear is usually diagnosed based on your symptoms, medical history, and physical examination. During the physical examination, Dr. Patel will look for a gap in the front of the elbow. Dr. Patel will diagnose a partial tear by asking you to bend your arm and tighten the biceps muscle. You may have pain if there is a partial tear. X-rays may be taken to rule out other conditions causing shoulder and elbow pain. Using an MRI scan Dr. Patel can know whether tear is partial or complete. Conservative treatment for a distal biceps tendon tear typically is limited to non-active individuals and elderly; this includes ice application, limiting activity, non-steroidal anti-inflammatory medications to reduce the pain and keep down the swelling. To restore the mobility and strengthen of the surrounding muscles, Dr. Patel will recommend surgical repair. Without surgery, 40% loss of supination (rotation of the forearm) strength will occur. Furthermore, these injuries are ideally treated within 2-3 weeks of injury. Dr. Patel may opt for several surgical procedures for distal bicep tendon tear where the distal biceps tendon is reattached to the forearm bone. Some doctors may choose a two-incision approach while Dr. Patel typically uses only 1 incision. Both procedures carry certain advantages and disadvantages. During the procedure, the tendon is attached with stitches through holes drilled inside the bone or small metal implants may be used to attach the tendon to the bone.